The California Umbrella 9 foot Aluminum Patio Umbrella is a classic patio style umbrella which is a staple of California Umbrella's history. Steel wire ribs complete a perfect patio style canopy and the simple crank open aluminum frame make this vintage design easy to use, it even includes a push button tilt feature! Your choice of polyester and olefin fabrics allows for a wealth of choices so you can really have fun with your outdoor space. 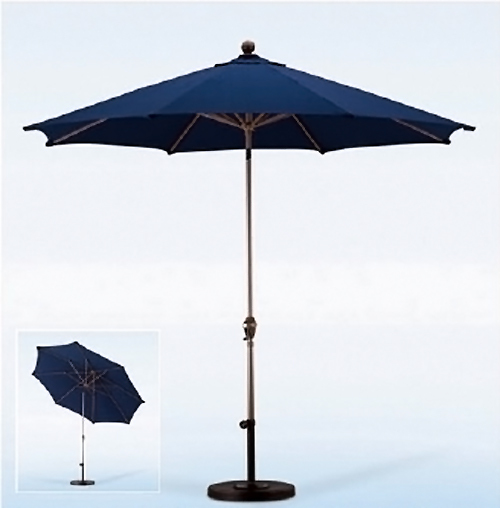 The California Umbrella aluminum patio umbrella incorporates steel wire ribs while the structure is supported with a heavy-duty aluminum pole adding to the longevity of this umbrella and provided flex during periods of high winds. Owners can simply crank open their umbrella and push a button to tilt the canopy towards the sun. This aluminum patio umbrella is available in two separate types of outdoor umbrella fabric those being polyester and olefin. Typically the higher the price of the umbrella fabric the longer the U.V. blocking time span. You can find that there are a large number of market umbrellas available from a great number of suppliers but for over sixty years California Umbrellas has not only stood the test of time but are noted within the industry for their premium line of umbrellas as they produce one of the finest if not the finest patio and market umbrellas in the industry today. They own their own factory, manage all aspects of quality control and produce a product you will be proud to own for many years to come. Please note that all umbrellas are sold without the base due to excessive weights and shipping charges which oftentimes run as much or more that the umbrella price alone.